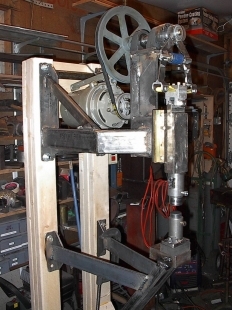 Homemade Yoder hammer fabricated from steel and supported by a wooden frame. Featuring an eccentric with a 1/2" throw and capable of operating at 500 strokes per minute. How do you adjust it? What is it? Sorry...didn't know there was a yoder hammer. Learning here all the time.